Just a quick and easy tutorial on how to make a bait farm. 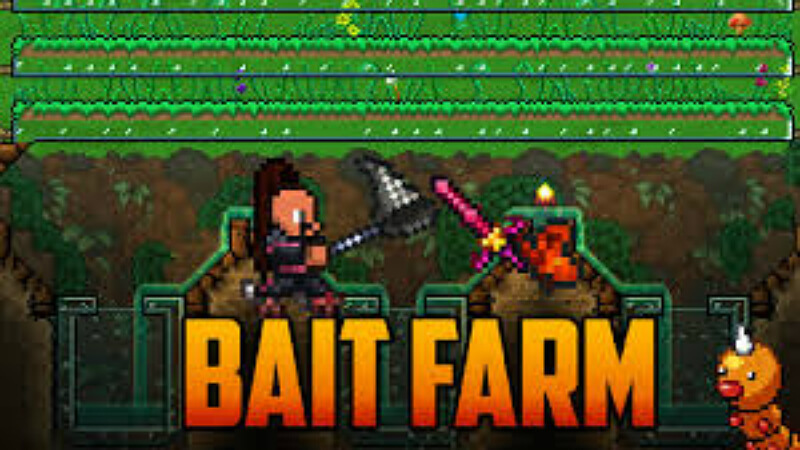 This farm will give you a regular supply of bait which is crucial for fishing. 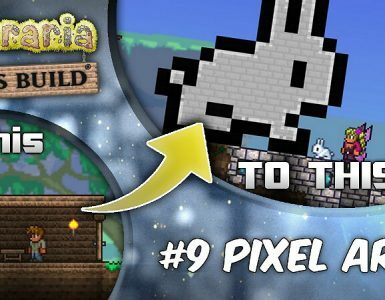 Now with the new input of fishing in our favorite game, Terraria, we need to find a new easy way to get our bait, the crucial element to fishing. How does bait work? The concept of bait is based around bait power (Rods also have bait power but this is a bait guide not a rod guide). Every piece of bait has a different value of bait power. For example, the grasshopper’s bait power is 10%. This means that when cast out the grasshopper has a 10% chance to not be consumed. 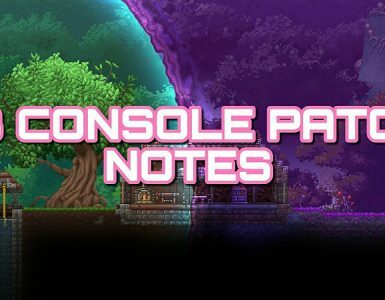 Bait power also affects the quality of the item you will fish out, higher bait power = higher chance of better items. In the rest of the guide, I will teach you how to construct your own bait farm. In this guide we will be farming: Grasshoppers, Butterflys, Fireflies and the odd worm. This I guess you could say is the exact same thing as a mushroom farm, besides the fact that with the new update this will also net you some nice bait farming aswell. So you want to start with making some nice long rows of dirt, it’s not that hard. (Mine are already Grassy, don’t worry, keep on reading). Then you either want to get your hands on some seeds or you can use the Staff of Regrowth or make the dirt blocks grassy. 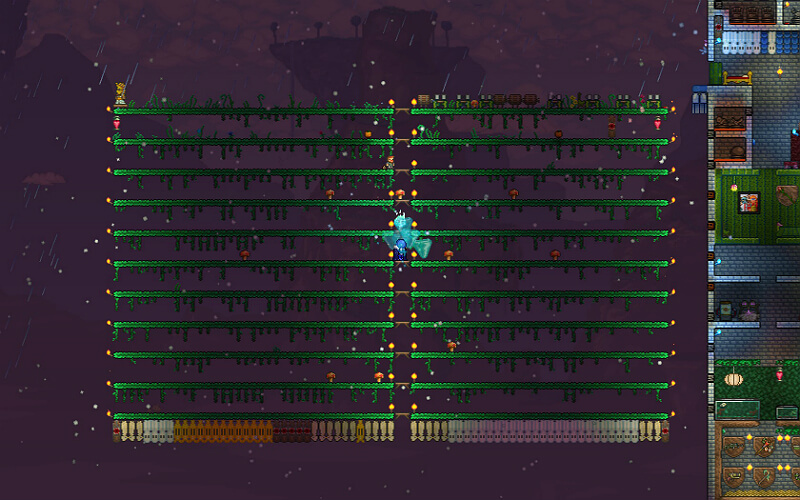 With my bait farm I just rigged up some dart traps to each row and I got rid of them all at once, this is a lot easier. 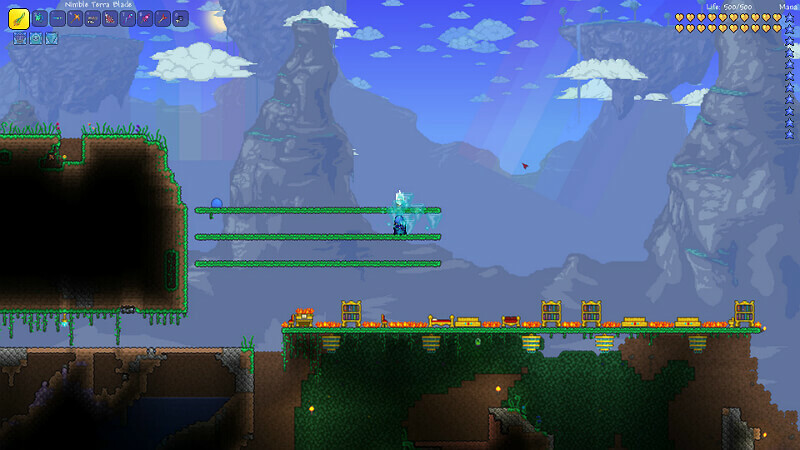 If you look on the right you will see Dart Traps hooked up to the Bait Farm. That’s basically how you will get the grasshoppers, but now for the butterflys. 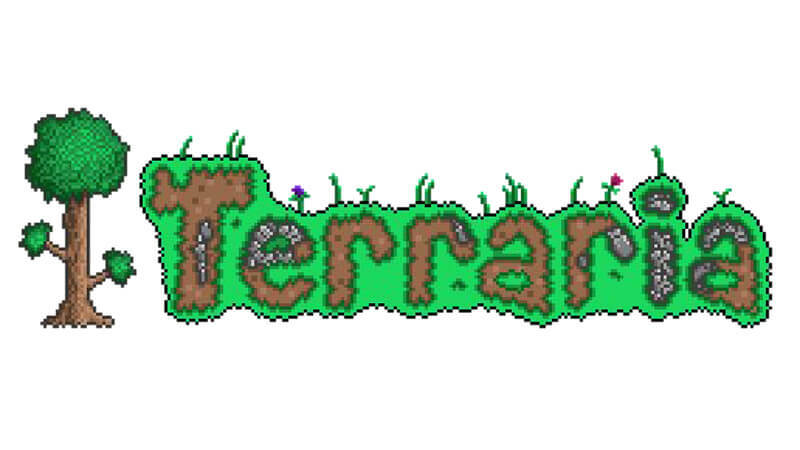 Now butterflys according to Terraria Wiki will spawn under the condition that the area is a forest. So now somehow we want to recreate a forest on our simple bait farm. This will encourage the spawning of butterflys, butterflys vary in bait power ranging from 10% up to 50%. 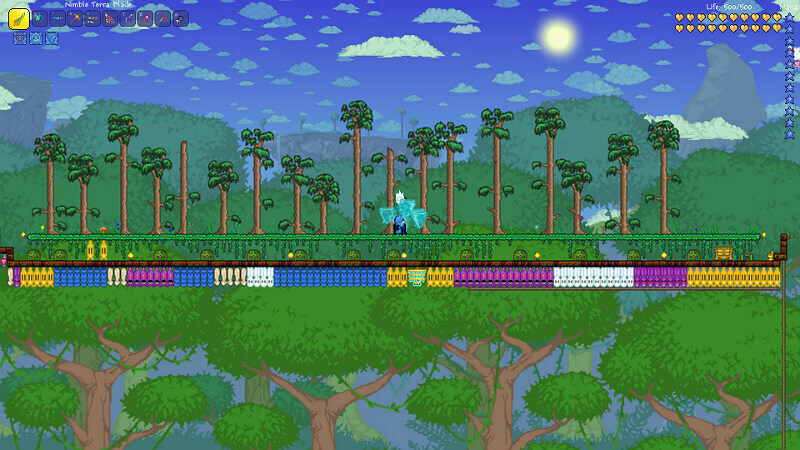 Trees encourage the spawning of other forms of bait and also double as a Tree Farm, but you don’t need as many trees as shown here. Otherwise you just don’t leave enough grass for bait farming. Aha and now for one of my favorites….. WORMS. Now the concept of worms is pretty dicey. Worms can only be acquired in 3 ways: You break the moss stones on the surface of the world. They have a random chance to spawn when you break the top layers of dirt blocks. They come out of the ground when it rains. So there is no real definite way to acquire worms. BUT….. if it does rain and your bait farm is big enough, it WILL net a huge amount of worms. 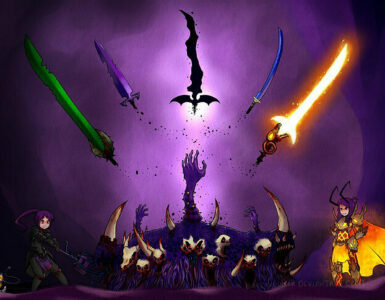 So when you see your world is raining, GET TO YOUR BAIT FARM. Ok, these cute little critters will spawn around your house at night if there is a Forest Biome around your house. So your bait farm will do fine. Just take a water candle at night near your house and run around catching fireflies. This usually nets us quite a bit of bait. 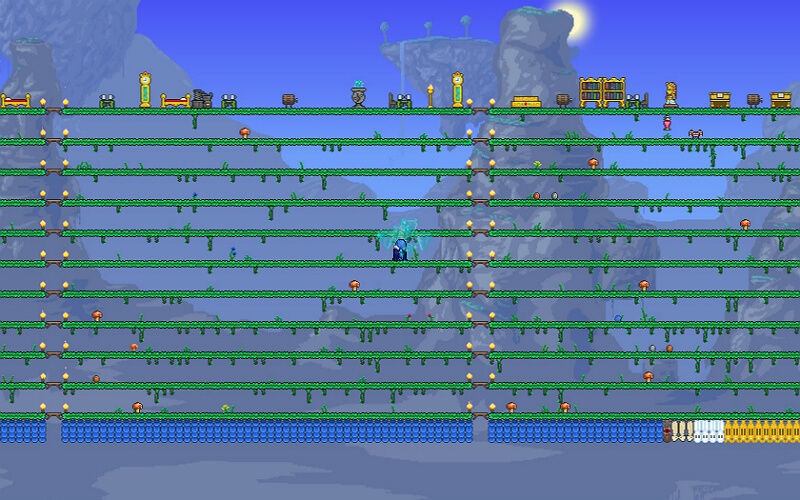 Finished farm with Platforms, Lights, Automated Dart Traps. Basically the whole package. 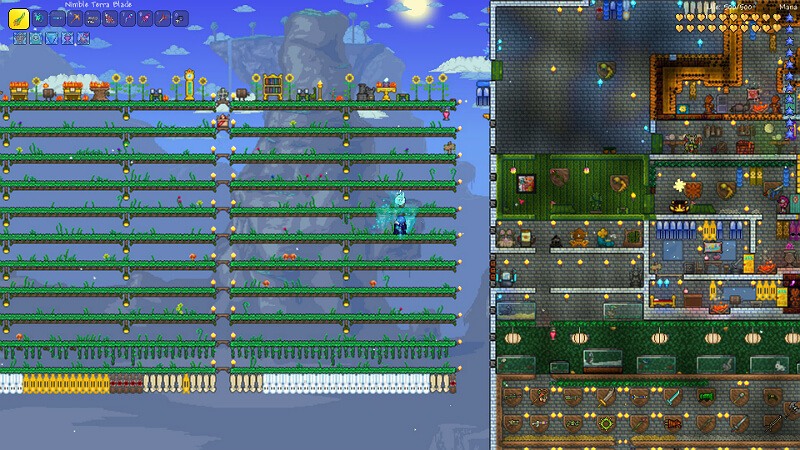 One thing my friend also helped me realise is that you should platform your farm so those annoying vines don’t grow. The platforms don’t affect your movement either. When planting trees to encourage the spawning of butteflies ect, remember not to spam them. You still need a lot of room for grass to grow, after all we are making a Bait Farm not a Tree Farm. Just remember that the bigger you scale your farm the more bait will be produced in the end. 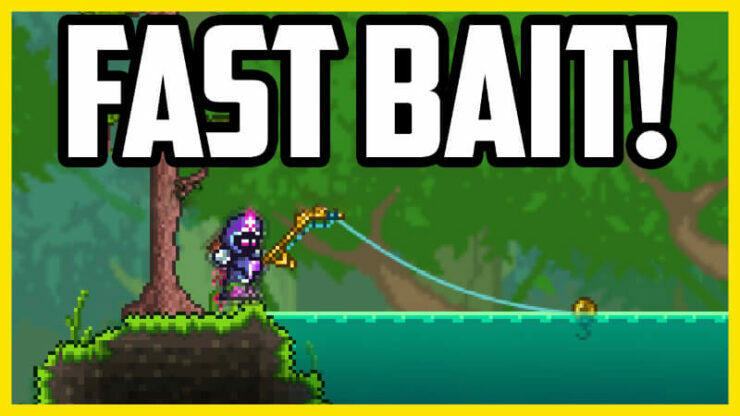 This is a very easy way to get a large amount of bait and I hope you all enjoyed the guide. Keep in mind that this was a smaller scale, the larger the rows of dirt are the more bait you will get. Bigger the farm the more bait you get.